TASSIN - Carte de Bretagne. .
TASSIN, C. - Carte de Bretagne. .
Carte de Bretagne. . - TASSIN, C.
Title : Carte de Bretagne. ..
Map maker : TASSIN, C.. Size : 14.5 x 20.4 inches. / 36.8 x 51.8 cm. 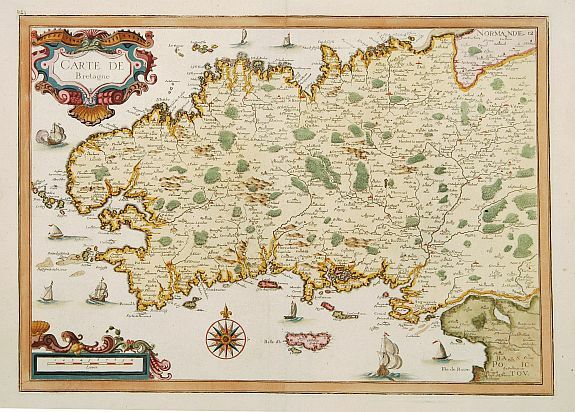 Description :"Attractive map of Bretagne. Depicts sailing vessels in the Ocean. Includes title in an ornamental cartouche on the upper left-hand corner. The atlas of the ""Cartes Generales de toutes les Provinces de France"" contains in-folio maps, very similar by their way of making, but not numbered. This atlas is composed by 26 numbered maps, realized on one sheet. This atlas has been printed first in 1634, then in 1637 and 1640, before Tassin sold his copperplates to A. de Fer and N. Berey in 1644." "Les Atlas Français XVI-XVIIe siecles, Tassin II, ." Condition : A good impression and in good condition.